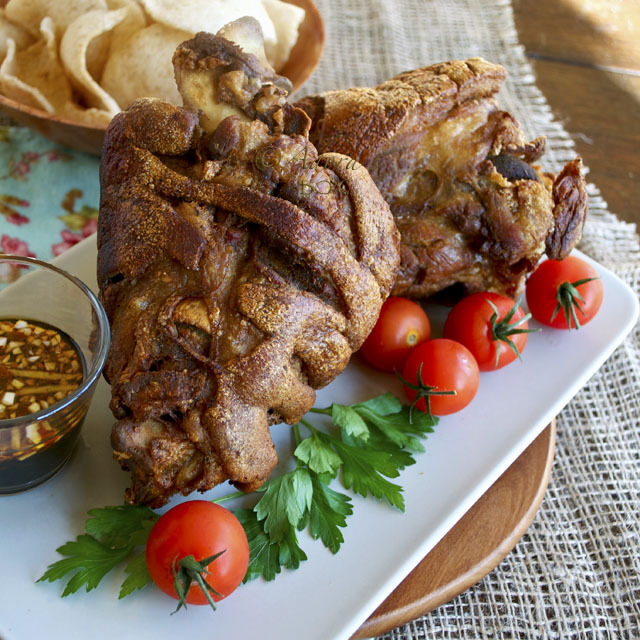 Filipinos eat pork more than any other meat. 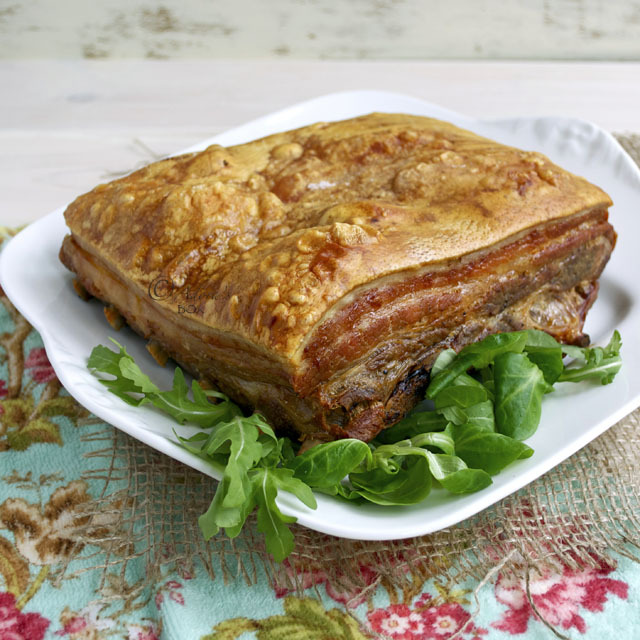 Although there are so many ways to cook it, the most popular recipes are the fried and roast dishes. 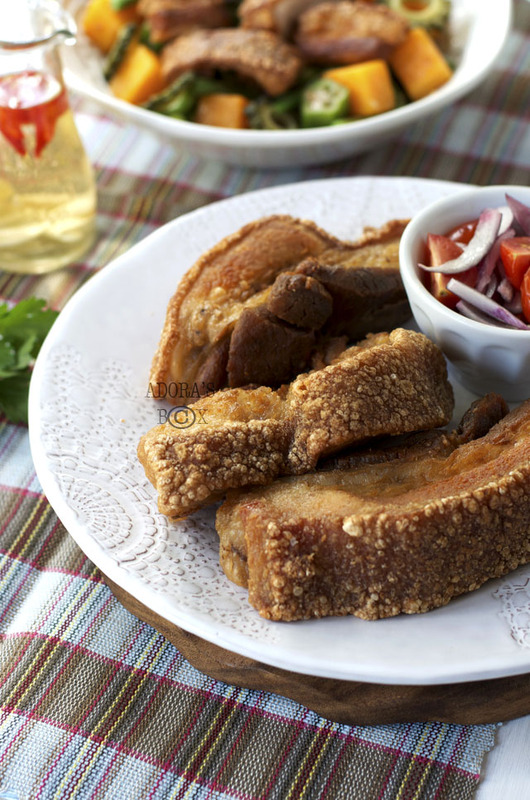 Fried pork is expressed in many ways and called by a lot of names but it still has the very same essence of crispy crackling skin and tasty succulent meat. 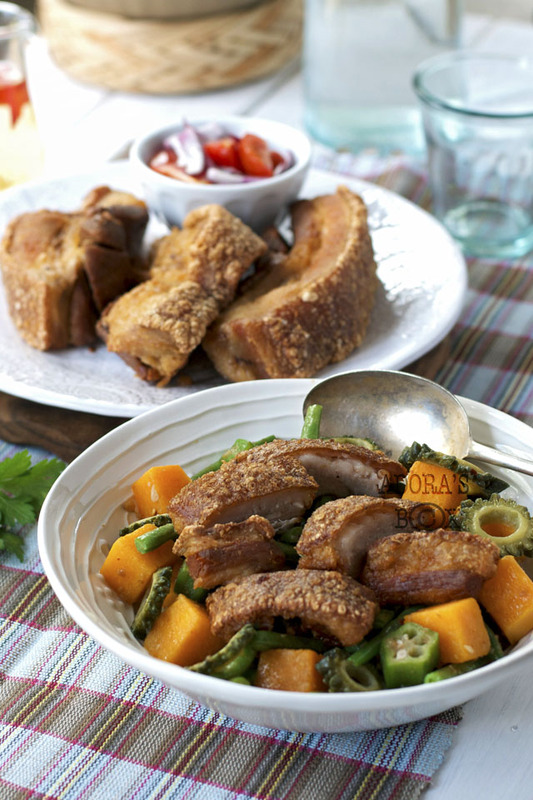 Bagnet is a delicacy in the Ilocos region of Northern Philippines. 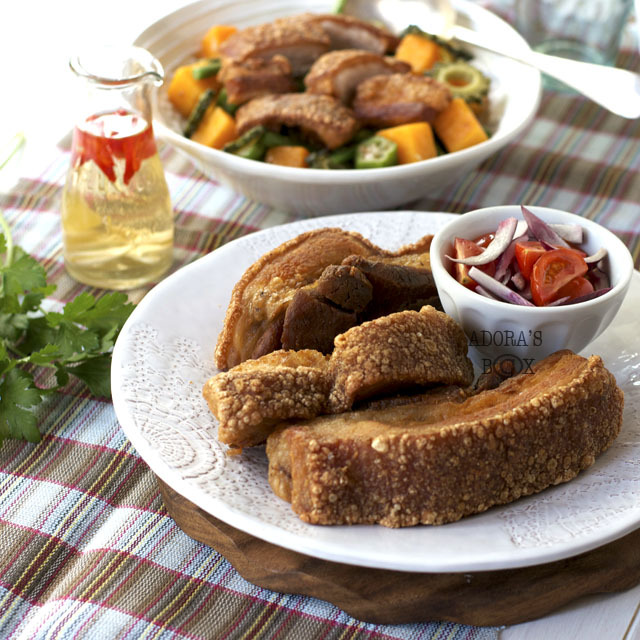 The pork belly joint is cut in big chunks, boiled with seasonings until tender then fried until the skin is very crispy. It is probably the most known and loved dish of that beautiful region. Although the cuisine of the province is not exactly a crowd puller, the place, the sights, the atmosphere is. 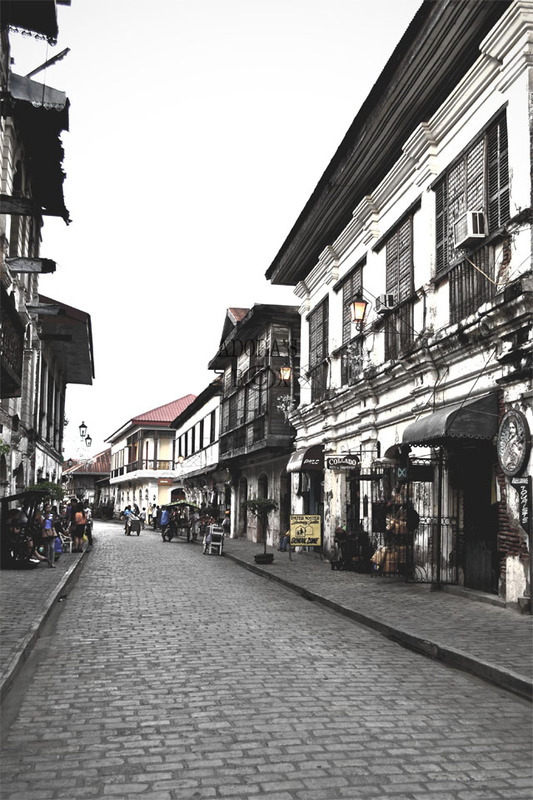 Calle Crisologo in Vigan, Ilocos Norte. 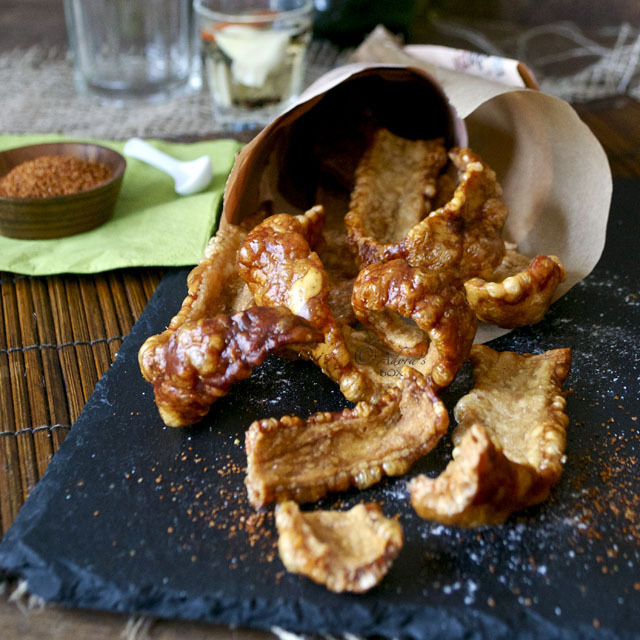 Although it is labeled as the chicharon (crispy pork rind) of Ilocos, it is more like lechon kawali (fried pork joint). It is readily available to buy, ready cooked in the region, and lately, the love for it spread to Manila where it is now served in restaurants. 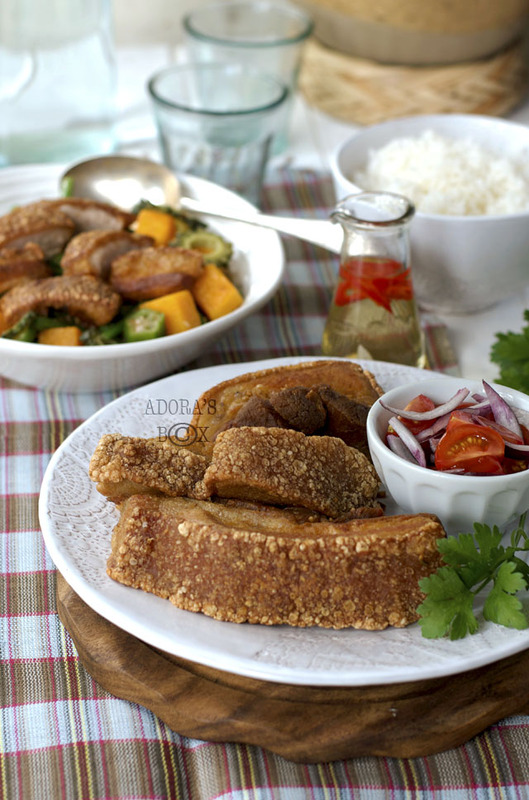 Bagnet is actually a good dish to make in quantities (if you love fried pork that much) because it can be pre-cooked, frozen and re-fried before serving. It would be a good party dish as well, as it can be cooked ahead. Leftovers are usually chopped and used in other recipes such as pinakbet, a vegetable dish seasoned with bagoong (fermented shrimp or fish). Cut the pork into 2 " wide pieces. Put in a pot or pressure cooker together with the rest of the ingredients (except the cooking oil) and top up with water to cover. Boil until tender, 1 1/2-2 hours in an ordinary pot or 25 minutes in a pressure cooker. When done, transfer to a cooling rack and scrape clean. Sprinkle the pork skin with extra fine salt. Leave to cool completely, then refrigerate. This may be done a day in advance. The pork pieces should be very cold and the skin dry before frying. Sprinkle a small amount of corn flour on the meat part to prevent it from drying during the frying process. Heat up a good amount of oil in a wok or pot. Have a domed lid and a heavy bowl ready. When the oil is very hot, carefully slide a few pieces of pork in the oil, skin side down. Cover with the lid and weigh down with the inverted bowl. Fry in low heat for ten minutes until the pork is medium brown. Transfer to a cooling rack. Repeat the process with the other pieces. Cool completely. The pork pieces may be frozen at this stage for future use. Refry pork pieces while frozen. To finish cooking, heat up the oil until very hot. Drop two pieces of pork, skin side down into the hot oil. Cover with the lid. Carefully tip the lid to open by a crack, facing away from you. Sprinkle 2 tbsps. of cold water and immediately put the lid back. This will help blister the pork skin. When the spattering subsides, take the lid off to let the steam evaporate. Fry until crisp on medium heat for about 10 minutes. If the pork pieces have been previously frozen, the above step still applies. Cook longer to ensure that the inside of the meat is piping hot. Chop into bite sized pieces before serving with garlic, vinegar and chilli as dip or with a salsa of chopped tomatoes and onions seasoned with anchovy bagoong or anchovy essence. 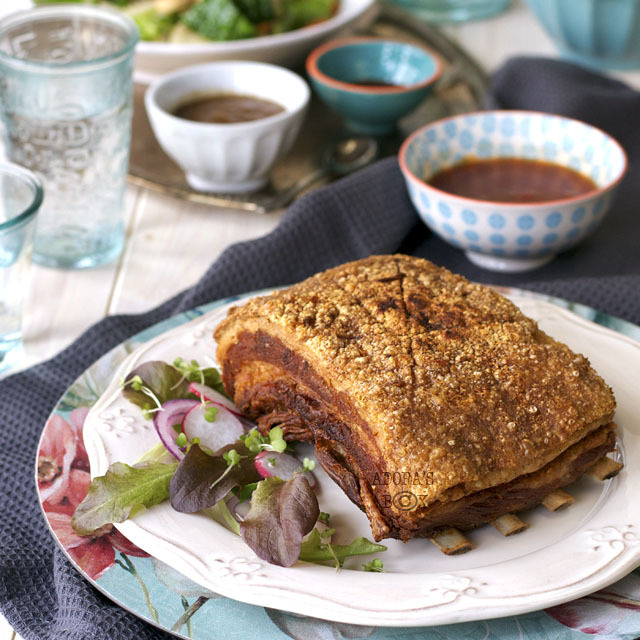 Note: Belly pork slices can also be used for this recipe. Cooking time will be shorter. Thanks for the cooking tips Adora. My grandma was from Abra, and we would look forward to all the delicacies she brought back, specially bagnet! Not too healthy, but it's one dish I crave. Thanks for sharing the story behind this dish. I enjoy hearing about the origins of food. Sounds very tasty! Refry from frozen. I have added another step above to clarify.